A few weeks ago, I posted the first part of a memo I’d written when I was an editor at Marvel Comics. The second part of the “Guidelines for the Appraisal of Story Structure and Visual Storytelling” memo focused on the basic principles of sequential visual storytelling. Here are some general principles that should be taught to new artists, writers and editors. -It’s your job is to tell the story in the clearest and most compelling fashion. -Design should be in the service of storytelling, not at the expense of the storytelling. -Visual storytelling is the art at the core of sequential visual media including comic books, film and video. -The principles of sequential visual storytelling allow creators to tell stories in a compelling manner. They also allow creators to experiment from a base of knowledge instead of from naiveté (a nice word for ignorance!). -Show, don’t tell. Clearly show all visual information so the script doesn’t have to include descriptive information—the script can then concentrate on non-visual information and subtext. -Strive for clarity and keep viewers immersed in the story. Viewers should not have to pause to figure out where their eyes are supposed to go to next or to wonder what is happening in the story. Otherwise, they will be pulled out of the flow of the story, breaking the suspension of disbelief. If the comic creator is doing his/her job well, it will not be readily apparent to the reader. The reader will be too involved it the story to actively appreciate the tale’s visual storytelling techniques (at least on the first read). There may be times when the artist wishes to be unclear in the service of storytelling. For example, if the story is from the POV of a confused or delusional character, the visual will reflect that state of mind. -Do not attempt to show every minute in a scene. Pick the “highlights”/key frames to show. -What is “in between” panels is important. The viewer will often fill in the “gaps” between panels with visuals they generate internally. -Clearly establish cast, environment & scenario. Keep the environments you establish consistent. Do not arbitrarily change a room or a scene you’ve established as you draw successive panels. If you show that there is only one door in the room your establishing, keep is consistent throughout the scene. If the status quo of a scene is purposely changed, show the transition action and clearly establish the new status quo. Long shots are generally used to establish a scene. Clearly show where everything and everyone is in relation to each other. Pretend you’re setting up a stage or film set. Know the environment from every angle. Medium shots are often used to show action. These shots usually show full-figures in action. The extremes of an action — the action’s beginning or ending — are usually the most dynamic parts to show. Think of John Buscema’s diagram in How to Draw Comics the Marvel Way where he clearly shows that the wind-up and the follow-through are the most dynamic parts of a punch. Close-ups are often used to show reaction. The action/reaction issue is related to “condensed storytelling.” When faced with a lot of visual information to convey in a low number of pages, newer artists sometimes panic. Their solution is to break down all of the separate actions and reactions into a series of small panels. This approach has its place when used as a pacing device but should not be used in place of good visual storytelling design. Kirby and Ditko got across a ton of information in each panel while also being dynamic. They did not break down each bit if visual information or action into its own panel. They confronted storytelling problems head on and solved them. Study and learn from the maters! -Keep the reader’s eyebath clear. Page and panel design should be in tune with the readers’ natural eye path inclinations. *See the “Map Orientation in Visual Storytelling” on this blog posted on Saturday, August 23, 2008 for more details. ** See the “Composition, Layout & Design: Types of Balance” on this blog posted on Wed., October 8, 2008 for more details. ***See the “Frame Formats and Visual Storytelling” on this blog posted on Fri., Sept. 12, 2008 for more details. That’s it - as always, I’m very interested in hearing your comments! In North America, this is a great time of year to breed some types of tropical fish in your backyard (or on a balcony for you apartment dwellers.). It’s fun and educational and – if you do things properly – you might even be able to make a couple of bucks in the process. You’ll need a large bucket, tub or similar water-tight container, a proper spot to place it, water, gravel and the right kind of livestock. Anything that will hold at least 10 gallons of water and is non-toxic will do. Rubbermaid makes 10 gal. plastic utility buckets and larger utility tubs that work well. I use Rubbermaid’s model 4226 utility tub. It holds over 20 gallons. You want the tub to get some filtered sunlight every day so that the plants will grow but not so much sun so that the water overheats. Placing the container under/next to a bush will filter the sun for part of the day. However, you may then have to deal with leaves falling into the tub. You can try placing the container near a fence that allows light to reach the tub early or late in the day, but shields it from direct light during the most intense periods. Standing water will attract insects, including mosquitoes. The fish I’ll recommend eat mosquito larvae. So, you’ll need to balance any concerns you have about mosquitoes and the live food source they provide the fish. At night, when mosquitoes are most active, I place a wooden frame with window screening stapled over the frame on top of the tub. This keeps out the mosquitoes and the leaves. It also prevents fish from leaping out of the container. * Depending on where you live, you may have animals that come around at night and try to go fishing in your container. Placing a brick or two on the edges of the screen frame at night should keep them out. Most of the fish recommend below are fairly hardy and will tolerate a wide range of water conditions. From your local aquarium or pet store, you’ll want to get a floating thermometer, tap water conditioner (neutralizes chlorine, chloramines, and heavy metals) and a freshwater pH test kit. While you’re there, get some food for your pisceans - high-quality flake food and some frozen brine shrimp. Keep the latter in your freezer and only defrost the amount needed when feeding the fish. Tap water should be fine to use as long as it is not particularly hard. The pH should be neutral (7.0) or slightly acidic (6.6 to 6.9) If the tap water pH is low or high, the store should have liquid or powder products that will adjust the pH. 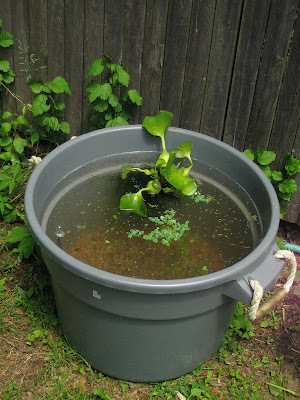 Don’t fill the container to the top – leave about four inches between the top of the container and the water’s surface. This will reduce the number of “jumpers” leaving the container and will help reduce losses due to nocturnal predators (cats, raccoons, opossum, etc.). Remember to take this reduction in water volume in mind when measuring additives like water conditioners and pH adjusters. Even though we are setting up a freshwater environment, we’ll want to add a bit of un-iodized salt to the water. This will replicate the low levels of salt that naturally occur in many natural freshwater ecosystems and will also help keep disease pathogens in check. Add one tablespoon of un-iodized salt for every five gallons of water in the container. Make sure you set up the container with the water and plants a week before you plan to add fish. This will allow for the water chemistry to stabilize. You should check the temperature of the water several times throughout each day to make sure the sun isn’t overheating the container. It’s best to keep the water below 83˚ F. If needed, move the container to a shadier area to keep the temperature in check. It’s possible to have no gravel in the container. This makes cleaning the container easier. However, I prefer to make the container’s environment as natural as possible. Most “natural” aquarium gravels will work. For the best plant growth, it’s best to use one that contains iron-rich laterite. Unless you decide to use plants that require a deep substrate for their roots, you’ll only need a layer about 1” think on the bottom of the container. You’ll want to get some floating plants with long roots that hang down. These plants will shade the water, helping keep the water from overheating during peak sun periods. One good choice is water hyacinth, a popular floating pond plant from South America. One plant will soon multiply into many and cover the surface of the container. You may be able to harvest some of them and sell them back to the aquarium/pond store. The long roots provide a place for egg-laying fish to spawn and provide cover for the fry (baby fish). The roots also help support microscopic life that the fry feed on. Another good plant is water sprite. 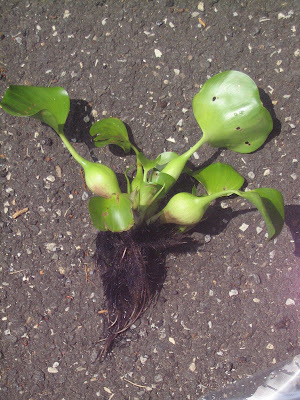 It can be planted in the substrate or left to float on the surface. When lest on the surface, the leaves become much broader and looks like a different species than the bottom-planted version. A small clump of Java moss on the bottom of the container will provide cover and a feeling of security for the fish when they are deeper in the container. The tub set up and ready for fish! Not all species of tropical fish are hardy enough to take the weather and temperature swings of outdoor life during the warm weather months. Probably the easiest fish to keep and breed are the livebearers including guppies, mollies and swordtails. 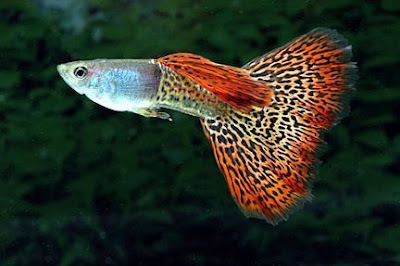 Guppies come in a wide variety of colors and patterns. Males exhibit flamboyant coloring while females’ colors are muted. However, some egg laying tropicals can also be bred and raised. Killifish (killies) get their name from the Dutch work “kil” which means “stream.” They are egg-laying tooth carps that are distributed around the globe. There are hundreds of species of killies - and many species have a number of subspecies or populations exhibiting great color variety. Some killies lay their eggs in aquatic plants where the eggs hatch after a few weeks. Others are called annual species. This is because they live in bodies of water that are often temporary, drying up for part of the year. When the rainy season begins, eggs from the previous generation that have been sealed in the moist mud are stimulated to hatch. The fry grow and mature quickly and the adults then begin laying eggs in the mud to prepare for the next dry spell. Sometimes the waters do not completely dry up so the adults live on. However, they are genetically predisposed to mature fast and to not live more than a few years. Killies are not often found for sale in aquarium stores. They are mostly bred and distributed by hobbyists through clubs. Fish and eggs are exchanged via mail. With guppies and killies, be sure you have at least as many females and males. The males will drive the females hard during mating and if the ratio of male to female is imbalanced, the females will become exhausted and may die. This is another reason to have a lot of plants in the container. The plants provide hiding places for the females so they can rest between bouts of spawning. Ideally, you should try to obtain trios consisting of one male to two females. One of my favorite killes is Fundulopanchax garderni - the “masaj” population in particular. Its coloring is fantastic. F. gardneri is not a true annual but their eggs can withstand a “dry” (moist) period. In fact, egg hatch rates for eggs that are stored in a sealed bag on some damp peat moss are higher than for those that are left in water. Check out this article for details on breeding and raising this fish. You can learn about killies in general online. One great resource is the American Killifish Association (AKA). You can order killies to be sent to you my mail form the AKA’s Fish & Egg listing. Limit your stocking to about 1 fish per gallon. So, if you’re using a 10 gal. bucket wit 8 gallons of water in it, do not add more than 8 fish. 6 would be even better and will allow a bit of room for the fry to grow. Do not add any scavenger fish such as catfish or loaches to the container. They will probably eat the eggs. Feed the fish twice a day. Most feedings should be frozen brine shrimp or blood worms. Don’t overfeed and pollute the water. At each feeding, the fish should be able to consume all of the food you give them within a few minutes. Soon the fish will associate your presence with food and will come swarming to the top when you arrive to feed, or just admire, them. If the plants are growing well, they will harbor small life forms that the fish will pick at between your feedings. It’s a lot easier seeing and appreciating the colors and antics of the fish in a clear-sided aquarium. Since the buckets and tubs don’t allow for that, you’ll still have a beautiful top down view of them. If the diameter of the container is big enough, you can always put on a snorkeling mask or goggles and dunk your face in to get a better view – make sure you don’t have any sunscreen, makeup, hair product, etc. on you when you do so that you don’t pollute the water. When fall approaches and the evenings bring the water temperature down to 70˚ F, it’s time to break down the container for the season. Odds are, you will have more fish than you began with and may be able to sell them to an aquarium store. The rarer and more desirable the species, the more valuable it will be to the store. You can also set up a traditional aquarium in your home and place some of the fish there to continue enjoying them all year long. If you try setting up one of these outdoor fish breeding containers, let me know how it works out for you. *I’m not sure why but some species of fish love to jump out of their container. Most killifish can find even the smallest opening in a cover and leap through it. ** You can also make your own blackwater by soaking peat moss in clean water for about a week. However, you need to make sure that the peat is not from a gardening source (since chemicals may have been added to it) and that it’s clean. Some aquarium stores sell aquarium safe peat. That article sparked my intense interest in the Maori and over the years I’ve acquired a significant library on New Zealand** history. In the beginning, mother earth and father sky were so close that there was no room for even light to exist. Between the dark embrace of their parents, numerous young gods had no room to grow. After eons of struggling, the god of the forest and his siblings used trees to wrench their parents apart, pushing father sky into an arch high above the earth. Light from the sun revealed the world and the young gods rejoiced, even as their parents longed to resume their embrace. The young gods covered the world with foliage, clouds and other barriers to keep their parents apart. The parting of earth and sky also released a host of evil spirits and soon conflict raged between the younger gods. The war spirit, Tu, fathered man and gave us weapons to slay animals for food. It didn't take long for men to learn to use the god's tools to slay each other. Mother earth and father sky parted forever so that their offspring would have room to grow – but they never stopped longing to embrace each other again. And, without their parents' guidance, many of mother earth and father sky’s children used their freedom to hurt each other. A model of a Maori warrior from the late 1800s. As chance would have it, my favorite band at the time I first read about the Maori was New Zealand’s Crowded House. The title track on their fourth album was “Together Alone,” a song about father sky longing to be reunited with mother earth. It is an ambitious production that features a Maori choir, Cook Island log drummers and a Salvation Army-type band. The song starts out very slow and simply and then builds to an amazing complex tapestry of unusual (to the western ear) melodies and rhythms. I really like the female Maori solo voice - the phrasing is so different from any western music. The song’s performers include the Maori (choir), the Cook Island representatives of the Maori Pacific migration (log drummers), early white settler influences (the Salvation Army band) and contemporary New Zealand elements (Crowded House) - all combined in a way that represents the cultural mix that comprises New Zealand today. Brilliant. You won’t see this type of musical creativity on American Idol. Watch the first third of this link to see part of the making of this song on You Tube. As a result of my interest in 1800s era Maori/New Zealand, I wrote a screenplay, “Yankee Maori”, and have adapted it for a large graphic novel project. The story is based on real people and events. The title character was an American who joined the British Army, was shipped out to New Zealand where he deserted and joined the Maori in their fight against the British and colonials. A fascinating historical figure who most Americans know nothing about. 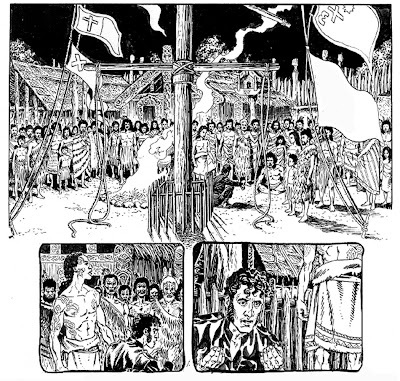 Here are a few panels from the graphic novel by the fabulous Enrique Alcatena. *During that same time period, similar conflicts were occurring in North America as the US military and settlers expanded westward and confiscated the lands of the native Americans tribes. ***Lego’s Bionicle line of toys and games used a lot of Maori and Polynesian names and language. Maori activists were incensed that a toy company was using their language for commercial purposes and feared Lego was trying to legally secure the rights to those words. After initially contesting the maori claims, Lego eventually acknowledged its insensitive use of the words and made changes in the Bionicle line’s names. While digging through some old boxes, I ran across a document I helped draft as part of the Marvel Comics editorial training program. The document was probably drafted in the late ‘80s or early ‘90s. You can see the influence of Robert McKee’s story structure seminars in this document. The transcribed document is posted below. I’d enjoy getting your reactions to it. Do you think it was/is a good set of guidelines? Is it too concrete or creatively inhibiting? Is it missing critical information? Has time made parts of it more or less important/relevant than when it was drafted? Many writers and artists understand classic story structure and visual storytelling on an intuitive level. As an editor, you need to be able to intellectualize and put into words the various concepts of story structure and visual storytelling so that you can effectively communicate with your writers and artists. This outline is an attempt to boil down some of the basic concepts to help you do so. The vast majority of stories we publish incorporate (or should incorporate!) classic story structure. There are several other approaches to structuring fiction. Both the minimalist and anti-structure approaches can and should be used on occasion. It should be a conscious decision by the writer and the editor when any approach other than classic structure is used. A writer should be able to understand and successfully create compelling classically structured stories before he/she attempts to use the minimalistic or anti-structure approaches. Picasso successfully painted and sculpted in abstract forms because he had such a firm grounding in realistic (representational) art. He knew what he was abstracting from. So, a writer should have a solid grounding in classic story structure before he/she tackles the minimalist or anti-structure approaches. The majority of prose fiction, TV and film scripts follow classic structure. Some tales will incorporate elements from two or all three types of story structure. There are no real RULES…only PRINCIPLES. The conventions of any structure system can be successfully broken if the underlying principles of the system are understood and accommodated. Some people, however, get so caught up in what they see as “rules” that their work lacks life or innovation. To combat this, encourage your writers to do the first draft of their story using an intuitive or gut-level approach. They should then go back and see where the story matches and diverges from the principles of classic story structure. Where there are variances, the writer needs to honestly ask themselves if altering the story so it’s in line with the principles will improve the story or make it worse. In the majority of cases, the story will benefit from observing classic structure principles. Occasionally, diverging from the principles, or modifying them, will result in a successful story told in a unique way. -External and emotional conflicts are resolved. An example of classic story structure is film is Casablanca. Examples of anti-structure films include After Hours, Monty Python’s Holy Grail, This Is Spinal Tap. For comics that are part of a series, clearly re-establishing the long term and short term status quos is essential for a successful comic. A major reason Marvel’s comics outsell our competitors’ titles is that we usually don’t assume the reader knows what the Marvel Universe (MU) is and what has been occurring in our cosmic playground. The same concept holds for titles that take place in “universes” outside of the MU – don’t assume your readers have read every issue of the title or have retained encyclopedic knowledge of the title’s world/universe. By giving readers just enough of the relevant back story and status quo info each issue, new readers are not left baffled (and alienated). By giving a new readers a good “hand hold”, we stand a much better chance of hooking them and turning them into regular readers. It is vital to grow, or at least maintain, a title’s readership. Most comic titles fight a battle of attrition as readers drift away for various reasons. Unless new readers are made to feel “welcome” that battle of attrition will end with the title’s cancelation. This does not mean you want your characters or narrator to be spewing lots of exposition. Getting the basic long/short-term status quo info into each issue should be looked at as an opportunity to make that issue’s story more relevant. -Set up that issues primary or secondary conflict. Look for ways to work the establishing info into the story in relevant ways so that the info is not expressed as exposition. This is easier said than done, especially if you have to keep coming up with new twists on how to accomplish this feat month after month. For examples on how to do this, look at almost any early issue of Louise Simon’s work on Power Pack. An unusual way to recap an established character’s origin can be seen in Punisher War Journal #1. Learn from the masters. There are issues of Lee/Kirby comics from the ‘60s where you learn the names, personalities, powers (and some of the limits to the powers), conflicts –all on the splash page! That splash can also set up that issue’s main action. The dialogue and art styles may appear dated now but the craft concepts on display are timeless. Characters should be introduced early and in clear ways that show their personalities and powers in active ways. Comics are a visual storytelling medium –never tell what can be shown. By establishing the characters’ abilities and limitations early in an issue, writers prevent un-established powers or abilities from seemingly appearing from out of the blue during a climatic battle. At the climax, it should be the winning character’s knowledge, resolve, skill, new technique using an established power, etc. that win the day – not some power/ability that was not previously established in that issue. So, Dr. Doom can’t suddenly use telekinesis in a fight unless it was established earlier n that issue that he’d gained that ability. All stories/issues should have a strong central conflict and theme that all of the other story elements tie into and reinforce. If possible, even sub-plots should tie into an issue’s conflict and theme. There should be no gratuitous plot elements. The conflict will often (though not always) involve at least one major character making a conscious and active choice between two or more difficult choices. We reveal a lot about someone’s basic character when we put that person into a crucible, testing their motivations and beliefs in severe situations. Shooter used to refer to this as a “can’t/must” situation: due to ethical, financial, time and/or physical restraints, the character can’t do something that the situation compels him/her to do. We should see what tips the character’s conflict decision in a particular direction. Whatever it is that does tip the decision scales needs to have been set-up previously in the story. The classic story structure elements below do not always have to be established in the order presented. If, for the sake of story impact, it’s better to switch 1 & 2, go ahead. Clarity of the storytelling should be the key point for all story decisions. 1. Establish long-term status quo: Character origin recap is often taken care of in the blurb at the top of the splash page. Characters names, powers, limitations, ongoing motivations, etc. should be re-established. Only long-term status quo info that is relevant to a particular issue’s story should be established. 2. Establish short-term status quo: This is anything that varies form the normal long-term status quo. 5. Show ramification of the conflict decision and the new short-term status quo. The protagonist(s) should have to deal with an escalating series of “roadblocks” or reversals as the story progresses. The character’s internal (both conscious and unconscious) motivation conflicts should spark or feed into the external/physical conflicts. The conflict decision that the character makes and the ramifications of that decision (along with the new short-term status quo) compose the remainder of the story. The next section of the document, VISUAL STORYTELLING IN COMICS, will appear in a future posting. I look forward to your comments on the above guidelines!